Maybe it did better on cable. ABC: THE DESCENDANTS 2 launched not just on ABC, but on a stack of Disney-owned cable networks, which may not have left much room for the broadcaster, since ABC managed only a 0.4 rating. An AFTER-PARTY special at 10:30PM was at 0.3. CBS: A Friday episode of BIG BROTHER easily topped the night at 1.4. It was followed by 0.5/0.5 reruns. NBC: DATELINE rose 0.2 to 0.9. It was preceded by an AMERICA’S GOT TALENT rerun at 0.8. 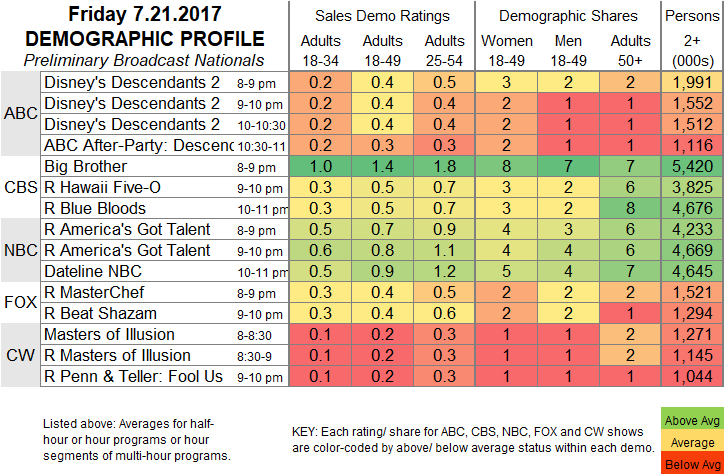 CW: A new MASTERS OF ILLUSION stayed at 0.2, and the reruns that followed were also at 0.2. Saturday TV is the usual mix of burn-offs, reruns and sports. On Sunday, NBC airs the season finale of SPARTAN, and on HBO, BALLERS and INSECURE happily follow GAME OF THRONES on the line-up.